Tourists will find out very quickly that Springfield, Illinois, was Abraham Lincoln’s hometown. Not only does it have the Lincoln Museum and Library with mind-blowing displays and striking holographic movies that we have previously written about, but it also has a four-block area restored to resemble the pre-1860s during the time Abe lived here. The only home he ever owned has been restored along with the neighboring houses. Gaslights have been added, sidewalks replaced with wood planks and several wagons of the time are standing in the streets. It was a pleasant step back into time especially since we were able to have two conversations with a Lincoln impersonator. Our first meeting was as this 6-foot-4 actor paused in raking the lawn of the home where Lincoln and Mary lived for 15 years, 1884-1861, and where their four sons were born. The actor stayed expertly in role, for example, asked about the instrument I was pointing at him since he had heard that the French had invented something that could capture a person’s image. The home tour is self guided, but so popular that visitors need a card from the nearby visitor’s center allotting an entrance time. We were impressed with the number of park rangers stationed in the building to answer questions. The house, furnished as it was when Lincoln lived there, has 50 of the home’s original items including Lincoln’s desk. He had made a comfortable living as a lawyer. The house had a maid’s room--one of very few jobs a woman could hold in that day and seen as an opportunity for a young girl to learn how to be a wife and mother. At the visitor’s center four movies on Lincoln were playing throughout the day, one featuring Raymond Massey. 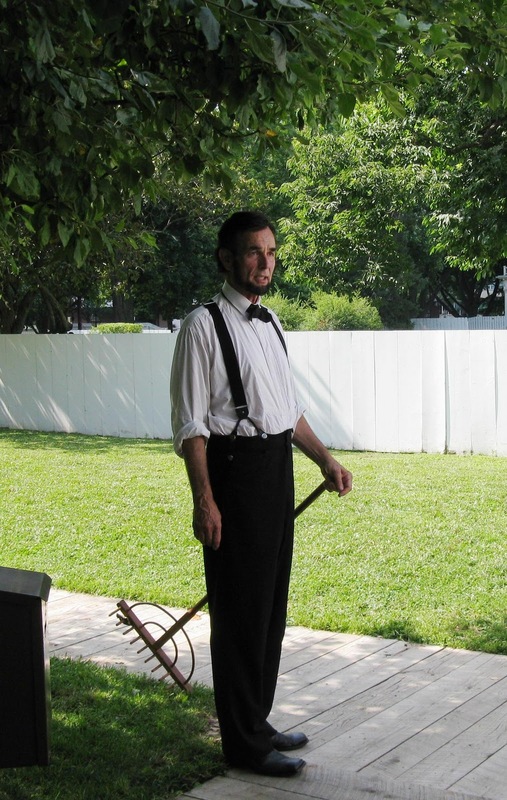 When we watched another movie about Abe’s years in Springfield, the impersonator in the yard was the actor playing Lincoln. Later we again talked with him. He looked very much as I expected Abe to look at the time he lived here. He looked more like Lincoln than Massey did. When I told the impersonator that I was impressed with his capturing Lincoln’s vocal tone, he said he had worked hard to integrate the vocal patterns into his performance. Abe fell in love with Mary Todd, a Southern belle from a family of higher social status, which complicated his courtship. He went into a deep depression when his first proposal of marriage to her was not accepted. I was reminded of similar problems that Presidents Grant and Truman had in their courtships. All three were noted for being firmly in love with their wives throughout their marriages. Mary was a great help to his political career using her family connections to get him national recognition. Some of the material in the Lincoln movies about his children was new to me. One son died early from tuberculosis and two others were known for their wild behavior. Our visit to the area was brought to a pleasant close by the performance of a group of costumed students singing songs of the period, particularly songs that were favorites of Lincoln.